With the Fourth of July just around the corner, here are some summer travel tips to help you (and your guests) navigate the state’s toll roads this summer. How visitors can stay Good To Go! If you have family or friends visiting this summer, this webpage can help visitors navigate our state’s toll roads and billing options. Did you know you can add a guest’s license plate to your Good To Go! account without installing another pass? Or, if you’d rather the in-laws took care of their own bills, then a short-term account is a great way for them to save money and avoid toll bills being sent to them back home. Just remember, if you’re driving a rental please check with the rental agency to see if they add any extra toll charges that are outside of our control. even without a pass, on the 4th of July. 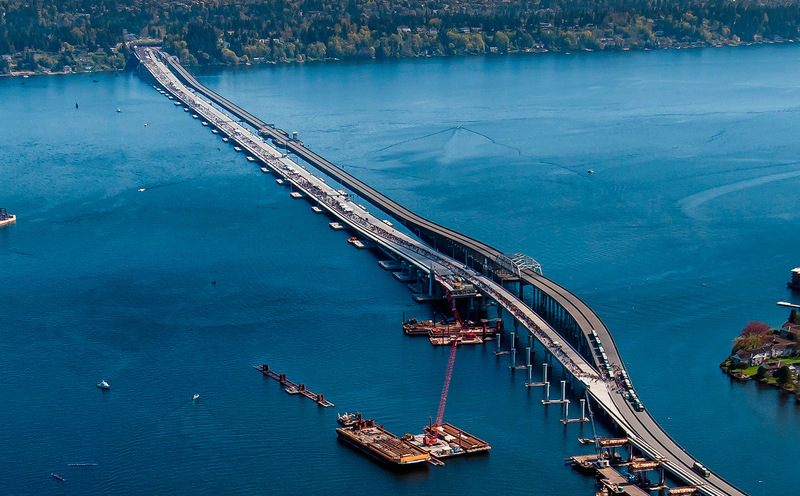 Toll rates on the SR 520 bridge will increase starting Friday, July 1. The new rates will be about 20 cents higher for Good To Go! customers, with a slightly higher increase for Pay By Mail customers which will be $2 more than the Good To Go! pass rate. There won’t be any increase to toll rates on any other toll road, including the Tacoma Narrows Bridge where a planned toll increase was cancelled thanks to new funding from the state legislature. With the warmer weather, motorcycle riders are hitting the roadway. A reminder that motorcyclists travel toll free on I-405 with a free motorcycle pass. Motorcyclists also ride for free on SR 167 HOT lanes (no pass needed) but need to pay tolls on the SR 520 and Tacoma Narrows bridges. 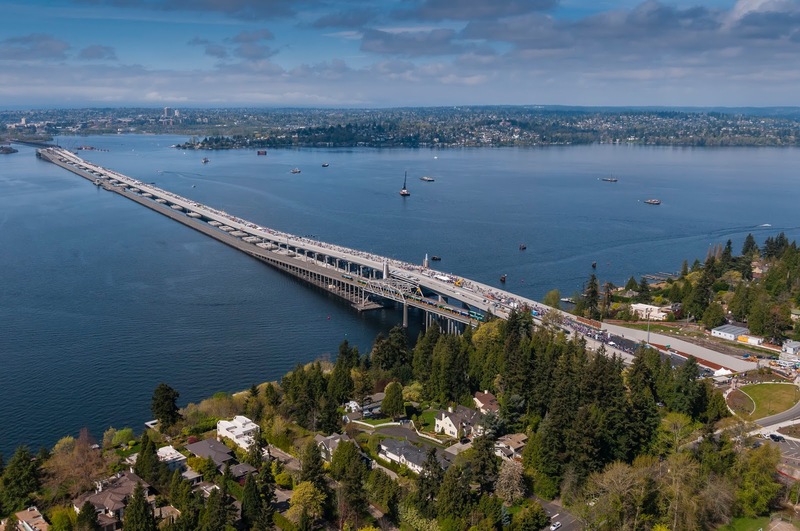 New toll rates on the SR 520 bridge begin on Friday, July 1. Customer service has been one of our top priorities, and we’re excited to announce several updates. This week we’re going to implement additional safeguards to help ensure that you don’t get caught off guard by an unexpected bill. If you have a Good To Go! account and you receive an unpaid toll bill (which can happen for several reasons) we’re adding additional notices by phone and email to warn you before you receive a civil penalty. Make sure to keep your contact information up to date so that we can reach you with important account notifications. But don’t panic if you do receive a penalty as one phone call is now all it will take to get unwanted late fees or civil penalties reversed if you ever do get caught by surprise. On the Fourth of July, toll rates on SR 520 will be on holiday rates and the I-405 express toll lanes will be free and open to all. We know our holiday travel charts are popular. We love them as much as you do. Unfortunately, we weren't able to produce travel charts for this year's Independence Day holiday weekend. Why don't we have the charts? There are a number of factors, but the bottom line is we don't have the data we need to confidently predict Independence Day travel this weekend. We know you rely on the travel charts, but we'd rather skip producing charts this one time than put out less-than-solid predictions that you use to make travel decisions. Drivers headed across Snoqualmie Pass are likely to find backups due to heavy travel combined with construction-related lane reductions. "Variable" day holidays – those that don't fall on the same day of the week every year – are harder to predict in general. There are far fewer Monday Independence Days, for example, to compare for historical background. For "standard" day holidays – Thanksgiving, Memorial Day, Labor Day – the predictions are easier (and more accurate) because we have year to year data. We will have Labor Day charts again this year. (For midweek variable holidays we don't produce charts because traffic is less heavy those years and it's hard to predict when or if people will travel mid-week). Historical challenges. The last time Independence Day was on a Monday was 2011, during the height of the recession with tight budgets and soaring gas prices. People didn't travel as much, so traffic predictions based on that year aren't as helpful. The previous Monday Independence Day was in 2005. A lot has changed since 2005, which makes those numbers less than ideal for predictions. Holidays aren't interchangeable. Travel is different depending on the specific holiday as well as the day of the week/weekend the holiday falls. If a holiday and fireworks are on a Saturday, for example, Friday traffic will be different than if that same holiday is on a Monday. So, while previous holiday predictions might give a general, overall idea of travel, the hour-by-hour predictions from other holidays can't be easily swapped in and out. 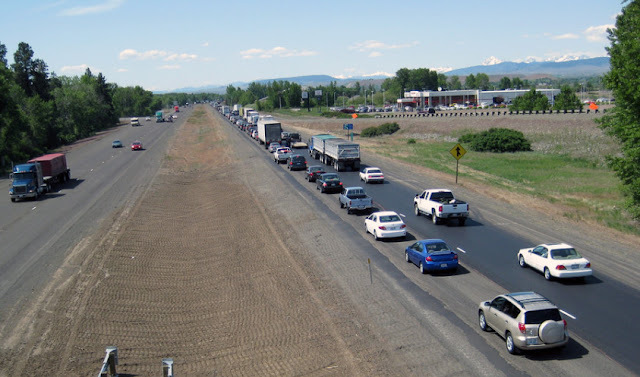 I-90 through Ellensburg is expected to be one of our most congested areas during Independence Day weekend. While we use historical and current traffic numbers in the analysis, our holiday predictions also are as much an art as a science. Analysts consider several factors – was there bad weather or a crash that delayed traffic; are certain holiday events on a specific day expected to alter driving patterns; is there a significant construction project that will add to congestion, or cause people to delay or detour? 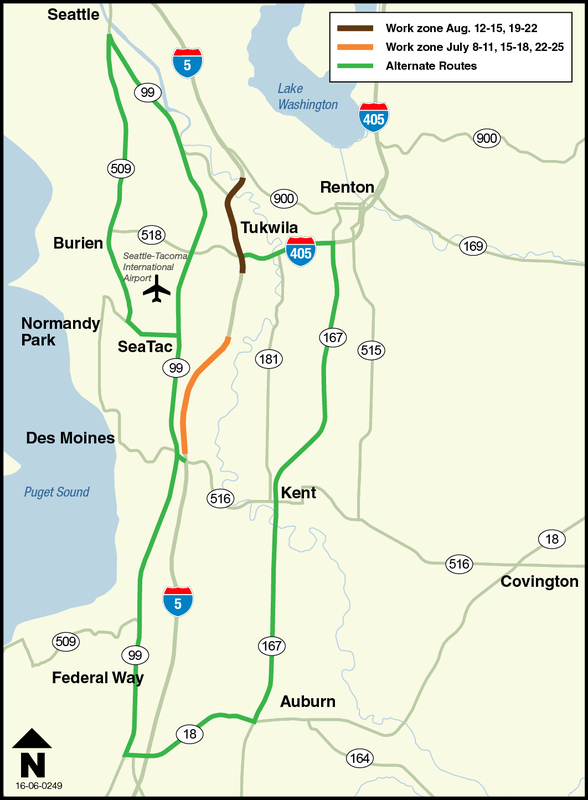 This year's multiple construction projects on Interstate 90 (see below), for example, would have presented quite a challenge in making predictions. After each year they also compare how their predictions panned out, and make adjustments from there. We've already started working on changes to our templates and analysis that will make variable day holiday traffic easier to predict going forward, but with that work still in progress, we were not able provide specific hour-by-hour predictions for the Fourth of July. Though we don't have hour-by-hour predictions, it's safe to say traffic volumes Friday afternoon and evening are likely to be heavy as people head out for their weekend. Likewise, drivers on the roads Monday afternoon and early evening should expect heavy holiday traffic. Use the travel information below to help you 'know before you go' this holiday weekend! Our ferries carry a huge amount of traffic during Independence Day. Be sure to make reservations or walk-on if possible. 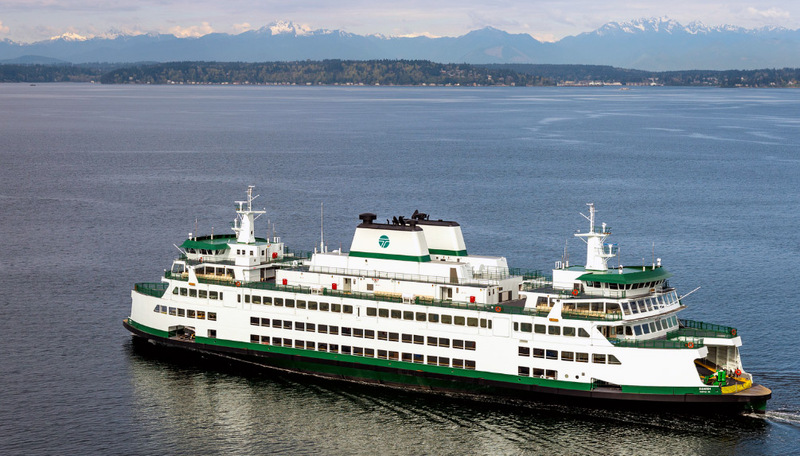 The Fourth is expected to be the busiest weekend of the year for Washington State Ferries. Extra sailings will be added for several routes. Reservations are strongly recommended for the San Juan Islands, Sidney, BC or Port Townsend/Coupeville. Travelers can also consult the best times to travel tab on the right of each route's summer schedule listing. If possible, it's always a good idea – and will save you long waits – if you can walk on. 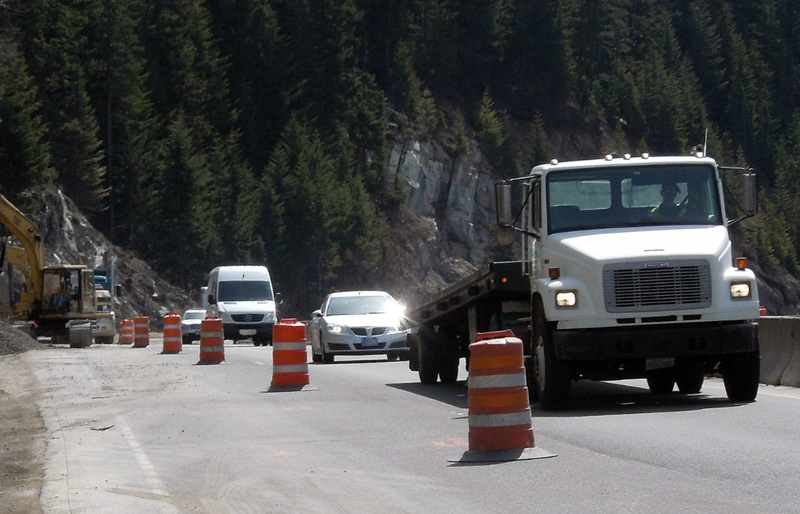 Travel across I-90 from the summit of Snoqualmie Pass to Vantage (pdf 742 kb) is going to be particularly tricky this summer – including the holiday – due to a number of projects that will ultimately improve travel for everyone. early or late in the day. A particularly tough spot is the Vantage Bridge, which is down to a single eastbound lane until the end of summer due to a bridge painting job (painting a bridge extends its life by preventing rust). Work won't take place during the holiday, but the heavy concrete barriers can't be easily removed and a work zone has to stay in place in case of high-wind emergencies, so the single lane of eastbound traffic will remain. Plan on lots of extra time to get through this area. Get informed about WSDOT's online tools, including mobile apps, traffic cameras and email alerts. Visit our online traveler information about traffic, weather and ferry schedules; call 5-1-1 for updated road conditions. Leave extra time for travel; don't rush and be extra alert: one crash can snarl traffic for hundreds of drivers. July 8-11, 15-18 and 22-25. 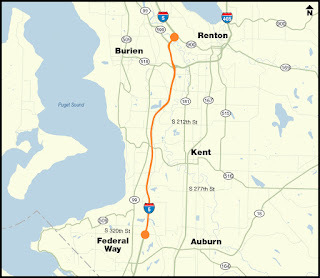 You may have heard a little something about an upcoming southbound I-5 rehab project between Tukwila and Federal Way. Well it's right around the corner! Drivers should start planning now for five weekends of lane closures: July 8-11, 15-18 and 22-25, and August 12-15 and 19-22. Whether you're planning on catching a Mariners or Sounders game, flexing your taste buds at the Bite of Seattle, or have plans to fly out of town, you're going to want to give yourself more time to get where you're going. Weekend backups are likely between 9 a.m. and 9 p.m. Reducing a stretch of southbound I-5 to two lanes during the weekend will mean backups and delays. How big? That depends on how many drivers adjust their travel plans. the weekend of Aug. 19-22. Plan at least an extra hour of travel time. Stay plugged in to traffic conditions before hitting the road by checking the WSDOT website or using the WSDOT app to get up-to-date before you leave home. with several on- and off-ramps closed. I-405, and state routes 99, 167, 509, 900 and 18. Remember, these routes will experience congestion as well. The weekends of July 8-11, 15-18 and 22-25 between South 188th and South 219th streets. The weekend of Aug. 12-15 from the Duwamish River to the Klickitat Drive overpass. The weekend of Aug. 19-22 at the Duwamish River. We won't be doing any work Independence Day weekend or the weekend of the Seafair Torchlight Parade and Seafair boat races. Why is WSDOT doing this? The interstate needs to be rehabilitated. It was built in 1965 and was intended to last 25 years. It's 2016. 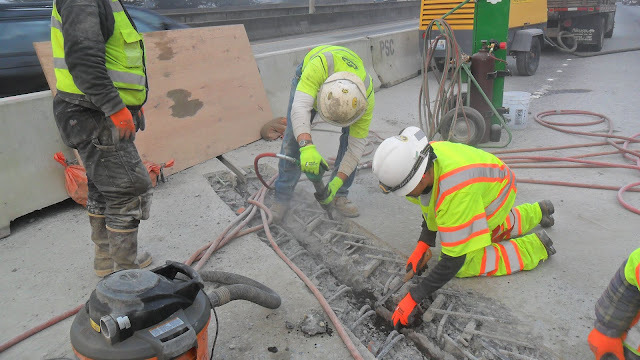 The 13-mile stretch of southbound I-5 between the Duwamish River Bridge in Tukwila and South 320th Street in Federal Way has potholes, wheel ruts, cracking and worn expansion joints. It ain't pretty. This project started in March and will continue into 2017 with most work being done during nighttime lane closures. Contractor crews will use a variety of methods to bring a better road surface to drivers. Crews will replace expansion joints, remove 238 concrete panels and pour new ones; repave asphalt; grind off ruts,; and repave a 2.7-mile section using a crack, seat and overlay process. We know this will be an inconvenience for drivers, so we want to send out a big thank you in advance. There's a lot to do in five weekends, but we're going to work hard during these few weekends to bring people a better and safer highway to travel on for the next few decades. Not all routine maintenance is considered equal. While Bertha, the SR 99 tunneling machine, will be at a planned maintenance stop for the next several weeks, there are some unique challenges to that work. Bertha has tunneled more than 1,500 feet since its last pit stop, and the front end of the cutterhead is now about 120 feet beneath Spring Street near Post Avenue in downtown Seattle. While performing regular maintenance is a crucial part of keeping the machine in good working order, working on a machine that deep underground is no easy task. 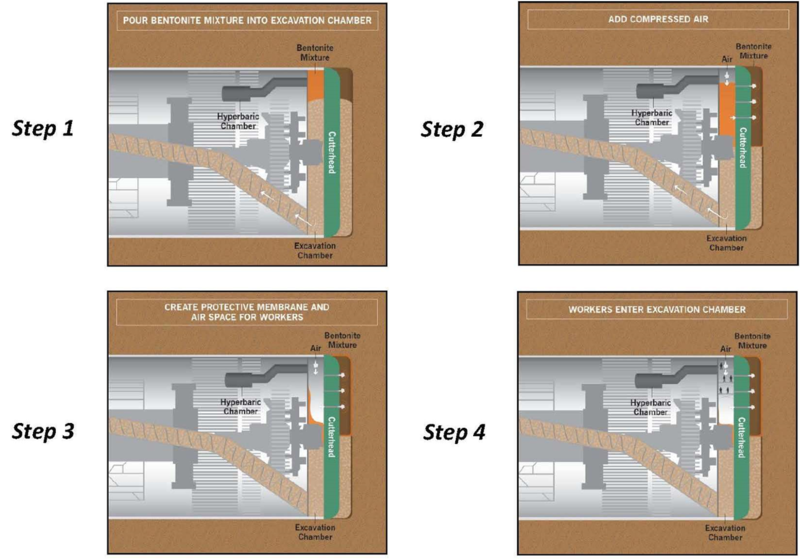 The steps needed for crews to do pressurized work on Bertha deep under downtown Seattle. First, crews need to stabilize the ground in front of the machine by injecting a type of clay known as bentonite into the front end of the machine. This creates a seal that prevents water and soil from entering – and air from escaping – their work space. Next, they'll over-pressurize the space by introducing compressed air, which pushes against the bentonite to counteract the ground and water pressure at the front end of the machine. This creates a "hyperbaric" work space with pressure levels that are higher than regular atmospheric pressure. This is basically like conditions during an underwater dive. Each person on the seven, five-member teams doing the work has to spend several minutes in a special chamber to prepare for the greater pressures they'll feel working in the hyperbaric conditions. When this type of work was done earlier on Bertha, they were able to spend up to an hour in these conditions before decompressing and returning to the surface, but the amount of time can vary depending on the pressure in the work space. Workers expect to begin the hyperbaric work next week. The length of the maintenance stop depends on how much work is needed. Seattle Tunnel Partners' previous routine stop near Yesler Way lasted about six weeks. You can stay updated on the progress on the Alaskan Way Viaduct Replacement website. Why am I sitting in a backup while the other direction has the express lanes open with free flowing traffic? I’m sure this has gone through the minds of many of you at some point – including me. While it’s not exactly in their job description, our traffic engineers must sometimes be performers in a careful balancing act – which direction will the express lanes relieve the most congestion from Seattle’s entire transportation system. Every weekday, the I-90 express lanes open eastbound at 2 p.m. because our traffic data shows much more traffic heads out of Seattle than into town from mid-afternoon to late evening. And by 5:30 p.m. Thursday, traffic going east across Lake Washington was extra heavy because of a collision that blocked the left lane of eastbound SR 520 near Montlake Boulevard. So when a jackknifed semi crashed just before 6 p.m. and blocked the two right lanes of westbound I-90 in the Mt. Baker Tunnel, a difficult choice had to be made: To switch or not to switch. Switching the I-90 express lanes takes at least an hour – and even longer when there is congestion. That’s because our crews have to sit in traffic to get to the express lanes gates to close them. Crews must then check the lanes to confirm that all traffic has cleared and that all signage and gates are in place. Closing the express lanes during the peak of the commute would have likely led to major eastbound congestion that would back up onto I-5 in Seattle. Keep in mind, eastbound SR 520 traffic was already hosed because of the crash near Montlake and already spilling onto I-5. Seattle to Bellevue travel times on SR 520 peaked near 70 minutes. Shortly before 7 p.m., engineers addressed “the switch” again. One lane of eastbound SR 520 was still blocked because the tow truck that needed to clear a vehicle was also stuck in eastbound traffic. Of course, westbound traffic was brutal as well, with Bellevue to Seattle travel times on I-90 at close to 90 minutes. Crews on scene at the I-90 semi collision reported to our Transportation Management Center that all that was needed was for tow to arrive and estimated a clearing time at one hour. 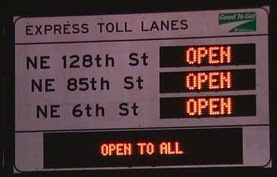 Remember, one hour is also the minimum time it takes to switch the express lanes. That means one hour with no traffic in the I-90 express lanes. It would’ve been a disservice to thousands of additional vehicles going eastbound. All lanes reopened just after 8 p.m.
Our main job is to keep traffic moving safely on all of our highways. And that’s why a decision was made to not switch the I-90 express lanes, at the risk of creating additional backups on other corridors in our transportation system. 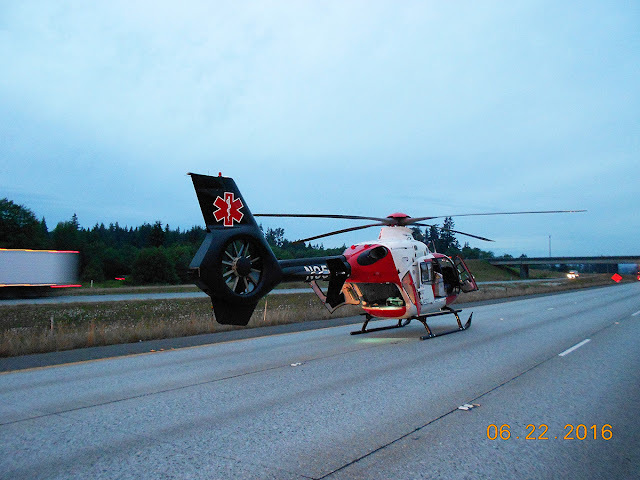 Road crews on Interstate 5 had a bad scare Wednesday night, June 22 in a scene that's becoming all too common in our work zones. A contractor crew was setting up traffic control devices on a paving project north of Stanwood. At 8:40 p.m., a pickup slammed into a truck mounted attenuator on the project. The crew escaped major injury, but workers were so shaken by the crash – and driver injuries – that work was cancelled for the night. Thankfully our attenuator truck did its job during a Wednesday work-zone crash, protecting the road crew from serious injury. The crash also blocked all of northbound I-5 for about one hour and caused a significant backup headed into Mt. Vernon. Thankfully the TMA – a giant, accordion-like buffer between work crews and drivers -- did its job and shielded the workers. But even with this safety device two people were sent to the hospital: the attenuator driver and the pickup driver, who was transported by emergency helicopter. Please join us in keeping both drivers in your thoughts. work zone crashes, the driver, passenger or nearby pedestrians are injured rather than workers. We wish this was a rare occurrence, but the danger in our work zones is very real. We average 916 work zone injuries a year on state roads. In 2015, nine people died in Washington work zone crashes. And most often, it isn't the workers who are at the most risk. The fact is, 96 percent of people hurt in work zone crashes in our state are drivers, their passengers or passing pedestrians. It's vital for drivers to slow down and be focused on the road at all times -- for the safety of highway workers but also for themselves and their fellow travelers. The driver of the vehicle involved in Wednesday’s work zone collision had to be airlifted to the hospital with serious injuries. 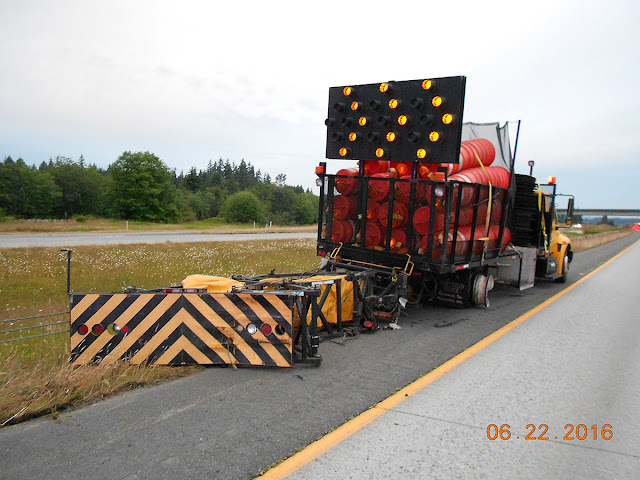 In this case, our attenuator truck did its job, taking the hit so that our workers didn't. But it doesn't always work out that way, as Greg King's story told us. So please, for your sake and those of highway workers, slow down and always be cautious and focused around work zones. We need your help to keep everyone in our work zones safe. 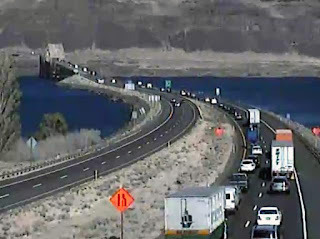 It’s no surprise that whenever we have to take away lanes on a roadway, traffic will back up and there will be delays. We’ve looked at what the backups are going to be when we reduce southbound I-5 to two lanes for five weekends: three in July in SeaTac and Des Moines and two in August in Tukwila. It’s going to be rough during the #SouthKingSlowdown, even with drivers using alternate routes like I-405 and state routes 99, 167 and 509. We will need everyone’s help to try to keep congestion from turning from a manageable backup to a nightmare weekend drive. We are going to see major traffic challenges each of these weekends, with backups potentially reaching several miles. Drivers should allow at least an extra hour of travel time between Seattle and the city of SeaTac between 9 a.m. and 9 p.m. We also expect additional congestion on the alternate routes. These estimates are based on 35 percent of drivers doing something different – delaying trips, using transit, carpools or vanpools or using other highways. That’s what we often see for a project like this. If more drivers use alternatives, backups and delays will be shorter, if not, well, we’ll see longer delays. 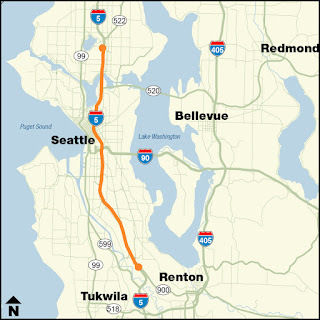 If you use southbound I-5 between Seattle and south King County, it’s time to start planning, especially if you’re going somewhere and you have to be on time – say, Sea-Tac International Airport. Whether you’re picking up someone or heading out on vacation yourself, being late to the airport can be a problem. Allow plenty of time. Check WSDOT’s Mobile app and traffic maps. Follow @wsdot_traffic on Twitter. Plan to use alternate routes like SR 99 or SR 509. Take transit – Link light rail provides a more predictable trip than I-5 likely will on these weekends. If your destination is somewhere other than the airport, these options can work as well. Also consider adjusting the time you travel (early or late are usually better bets), or stay close to home during the closures when possible. There are other alternate routes to avoid southbound I-5 as well. 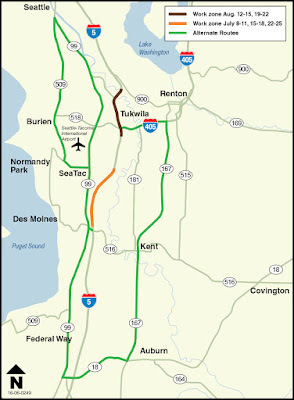 From Renton you can go south on SR 167 and SR 99 works for people in Tukwila. In either case you can rejoin I-5 using either SR 516 or SR 18. The bottom line is you need to plan ahead. We understand this is going to be hard on a lot of drivers, but this work must be done. I-5 is 50 years old; it was designed for 25 years. A few weekends of pain now will result in decades of a functional interstate. Summer in the Pacific Northwest is always pretty spectacular with fantastic places to explore and an abundance of special events. But it also creates a challenging dilemma for us. 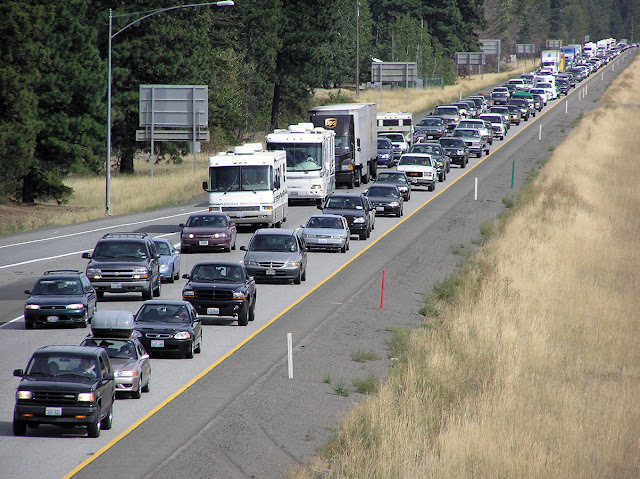 We know people love to take to our highways this time of year, with plenty traveling across I-90 on road trips. At the same time, so much of our road work has to be done during those few months when we can be pretty sure we're going to get dry weather. Accommodating both of those is a very difficult task. 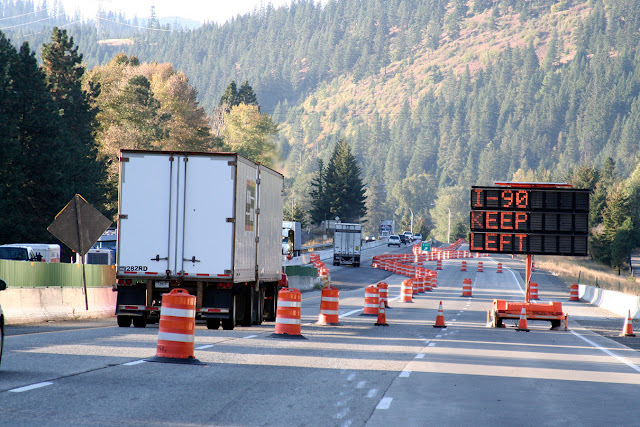 Travel across I-90 from the summit of Snoqualmie Pass to Vantage is going to be particularly tricky this summer, due to a number of projects that will ultimately improve travel for everyone. In the meantime, we want to help you prepare with tips on planning and timing to help avoid significant congestion. Heavy construction activity across I-90 this summer will lead to delays, so be sure to plan ahead to avoid as much congestion as possible. Why is there so much construction this summer? I-90 is the main east-west transportation corridor in our state with more than 27,000 vehicles traveling over it every day, and that number doubles on holidays and summer weekends. With that much traffic, the road is in rough shape and there are a number of areas that need to be repaired. Much of that work requires dry pavement and work conditions to get done. What's with the backups and congestion? In order to repave, build and replace lanes we have to build detours to divert traffic around the work zones. These detours are built before the actual project starts and stay in place until the project is finished. Unfortunately, there are going to be areas where traffic backs up because we are taking traffic from two lanes to a single lane or making lanes and shoulders smaller. We try to keep two lanes of traffic open in the busiest direction over the weekend. For example, eastbound is busiest on Fridays so we try to keep two lanes open, but may only have one open westbound, and then reverse it on Sundays. The heaviest congestion we're seeing is westbound near Cle Elum from mileposts 84 to 93, where we're repaving the lanes and have to divert traffic around the area via a single-lane detour. You can avoid these backups by using an alternate route via US 97 to SR 10. Another tough spot is the Vantage Bridge, which is down to a single eastbound lane until the end of summer due to a bridge painting job (painting a bridge extends its life by preventing rust). Plan on lots of extra time to get through this area. Oh, and don't forget that there is also rock blasting that will close Snoqualmie Pass during some weeknights, usually for about an hour, throughout the summer. This is part of our major project to improve travel and safety across I-90. Many work zones have reduced highways to one lane or lead to detours. Be sure to avoid all signs and be safe in work zones. Is anyone working around here? It can be frustrating to crawl through a work zone and not see anyone working. We get it. In most cases, while work schedules may vary, it is often unrealistic to remove work zones for short periods of time and then reestablish them. For example, with the Vantage Bridge, painting doesn't happen on weekends but the work zone must stay in place. The barrier separating the eastbound lanes and associated re-striping work takes several days to remove/install, which could add more time and cost to the project. Additionally, the contractor needs to be able to access the work area 24/7 because if there was a high-wind situation, the containment system needs to be removed immediately so the bridge doesn't get overloaded and damaged. That can only be done safely if the work zone barriers are always in place. Planning ahead is one of the best things a traveler can do to help avoid congestion. If you know what is out there, you can better time your trips – when possible – to avoid backups or heavy congestion. Going early or later helps, and if alternate routes are available, they can be good ideas. Also, congestion is exacerbated by collisions. We've seen regular I-90 backups become huge just because of a crash. So please, pay attention on the road, focus, work together and be patient. And when you're near work zones, please be sure to slow down (most have reduced speed limits), give them room to work and be extra alert around them. 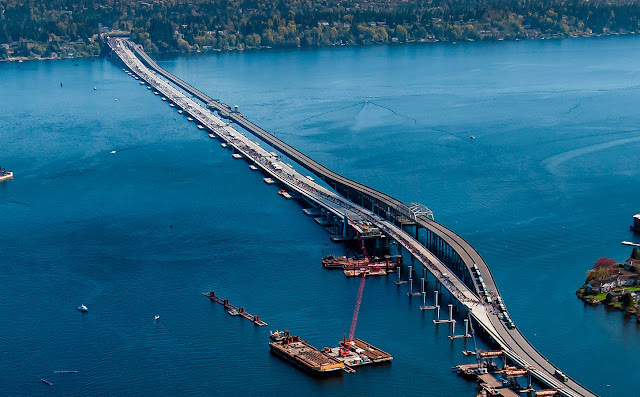 Back in April we shifted traffic onto the new SR 520 floating bridge. This bridge is so new, this drone video, taken just after we shifted traffic onto the new structure, almost looks like an animation. And while the new bridge is bigger, wider and a whole lot safer, you might wonder what’s happening with its predecessor. Now that the new floating bridge is built, contractor crews are removing the old floating structure. Vulnerable to wind and waves and built for a 50 year life span back in 1963, the old floating structure is being decommissioned by the same contractor that built the new bridge. Removing the bridge is part of the SR 520 Floating Bridge and Landings project contract and is expected to be complete by the end of the year. Remove the barrier, railing and roadway surfaces from the old bridge (done). Remove the old trusses that connected the floating bridge to the fixed structures (done). Separate and float out the old pontoons. Remove the fixed approaches on both ends of the old floating bridge. Remove the anchor cables that kept the bridge in place. 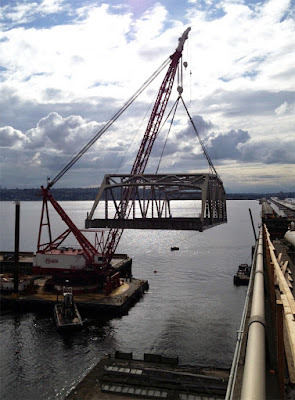 Crews remove one of the trusses from the old SR 520 bridge. Some of this work is happening on barges near the old bridge and the material is then transported off the lake. Of course, the contractor follows permit conditions and best practices to keep the materials out of Lake Washington. We’ve outlined more bridge decommissioning details in this folio. Just like when we separate the paper and plastic to recycle at home, the old bridge is being separated and repurposed. The pontoons will be floated out of the lake and reused elsewhere as piers, breakwaters and wharfs. The steel from the trusses and rebar from the old structure will be melted down and reused after they are separated from the concrete. The bottom line: We are doing our best to encourage our contractors not only to be sustainable during construction, but also be responsible and environmentally friendly during de-construction – almost always recycling. So while we say goodbye to the old bridge, we won’t necessarily bid it farewell…there’s a good chance the recycled components will reappear again – perhaps in a road or building coming soon near you. My co-workers and I spent last week pretending to respond to a giant earthquake as part of the Pacific Northwest's Cascadia Rising drill. Our main takeaway? When a 9.0 earthquake hits, it will be a challenging – and slow – recovery. And everyone, and I mean EVERYONE, needs to do more to prepare. Bainbridge Island residents had to shelter in place because the ferries were not in service and the Agate Pass Bridge was closed. Coastal communities were flooded; coastal highways were washed away in a tsunami or covered by landslides. Sound impossible to tackle? It certainly felt like that at times. Any one of the above emergencies would require a major response on a normal day -- and these would happen all at once in a 9.0 earthquake. That's why disaster preparation is so critical. We activated Emergency Operation Centers in Olympia as well as all our regions and several divisions during the Cascadia Rising drill. 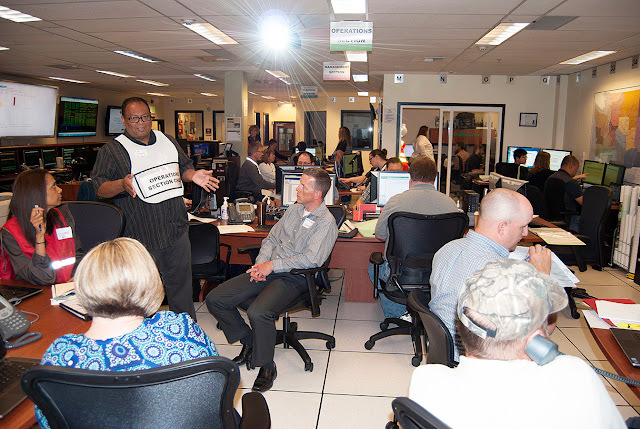 Here, the Headquarters EOC staff marshalled staff from across the agency to respond to damage reports, lining up resources and mapping the damage and closures. Our mission at WSDOT is to keep people and goods moving. After a devastating disaster like a Cascadia-level quake, life-safety access becomes our first priority. Our crews must focus on clearing routes for first responders and other essential vehicles. What's essential? That means all public traffic is halted – even for the very understandable response of wanting to try and reach loved ones. On day three of the drill we had participants asking when roads would be reopened to the public. The answer? Not for a while. Restoring emergency access was a massive undertaking on its own. Much as we'd like to, there's no way to quickly recover from such devastating destruction. 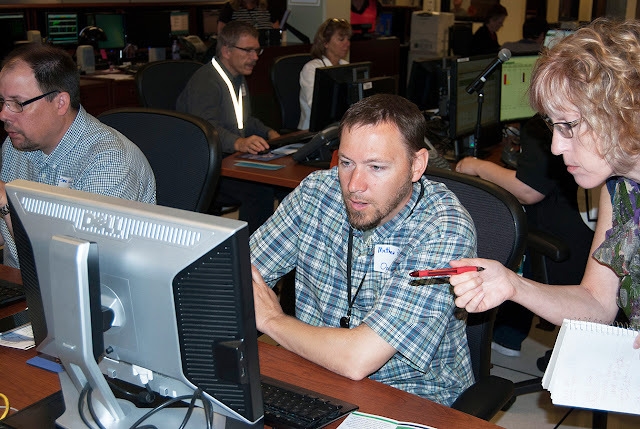 Our staff at the Headquarters Emergency Operations Center double check information about earthquake damage and response during the Cascadia Rising Drill. Verifying damage and resources was key to responding quickly. When the Skagit River Bridge was knocked into the river in 2013, for example, we marshaled the agency's forces to have a temporary replacement in place within 27 days. It was hailed as a major accomplishment and we were justly proud of the effort – but it still was a matter of weeks, not days. And it wasn't competing with hundreds of other road, bridge and ferry terminal repairs. Recovery from a Cascadia-type event will be a marathon, not a sprint. As hard as emergency crews will be working, the reality is people should prepare to fend for themselves for up to two weeks after a 9.0 earthquake. A Cascadia event will cause unimaginable devastation. You're not going to be able to drive to the store, or hospital or gas station. Personal preparation will be key to survival. Neighborhoods are going to need to band together and take care of each other as crews work to establish even rudimentary emergency access. It's not that emergency crews won't be working around the clock to help, but the sheer magnitude of the work will be overwhelming and take time. A map showed road closures, damaged bridges, alternate routes, damaged ferry terminals and other information. Seem overwhelming? Set a goal of stocking one new emergency kit item during your weekly or monthly grocery store run. This lets you chip away at the task over time. The sooner you start, the more prepared you are for both small and large emergencies. Drills like Cascadia Rising identify frightening realities, but they're not meant as scare tactics. They're essential tools to help us identify gaps or areas for improvement, which makes us more prepared for real emergencies. to comments and questions and monitor media reports. Drills also give us valuable exposure to our cohorts in law enforcement and emergency response. Cascadia Rising was the largest drill ever conducted in the Pacific Northwest with 20,000 people taking part. Invaluable relationships have been formed between city, county, state and federal agencies and with that a better understanding of everyone's roles and capabilities. Do we still have work to do? Absolutely, and we are always striving to improve. But thanks to everyone's efforts last week, the Pacific Northwest is more prepared for a large earthquake than ever before. Personally, this drill has identified several items I plan to add to my own emergency supply kits. I've heard others make similar comments. I hope it does the same for you – even if the next Cascadia-level quake is 100 years away, every bit of preparation we do now will pay untold dividends during our next emergency. If there's one thing I hate Tweeting during the morning commute, it's, "We have to do emergency expansion joint repair." It's usually followed by a collective groan from Puget Sound commuters. Unfortunately, I had to type it Friday morning for a situation on northbound I-5 just past the Seneca Street exit in Seattle. 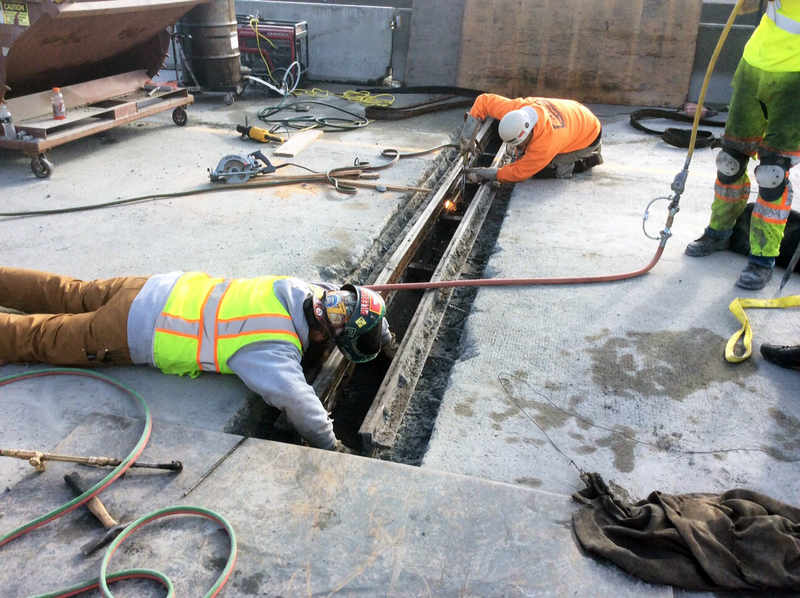 Crews work to repair an expansion joint on I-5 in Seattle. At 6:30 a.m., the Washington State Patrol received a call from a traveler who saw part of an expansion joint rising above the bridge deck when other vehicles drove over it. WSP and our Incident Response Team immediately drove to the scene and used their vehicles and cones to keep drivers safe and off the damaged joint. This traffic control meant that the right lane of northbound I-5 where the interstate is two lanes — just past the Seneca Street exit where the Cherry Street onramp merges — was down to one lane during the heart of the Friday commute. in the Everett/Marysville area in Snohomish County. 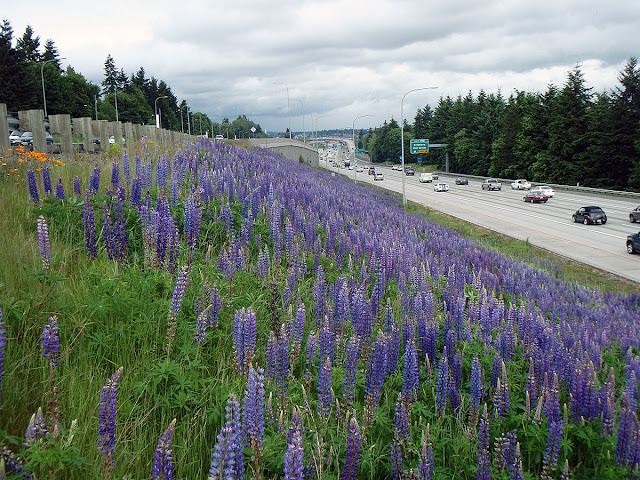 What steps WSDOT took and what's next? WSP and IRT determined that the joint needed immediate repairs and reached out to our bridge technicians. The bridge crew fought through rush hour traffic to the scene and when they arrived they assessed the situation and determined that there was a safe temporary repair available. Crews cut out the damaged metal from the joint and then used a cold filler (one that doesn't need time to cure like concrete does) to make sure the joint area was level with the rest of the driving surface. and Interurban Avenue as part of a major road rehab project. Every expansion joint repair job is different. Sometimes they're an easy fix, other times they're a bit more complicated and take more time — like this one. Bridge crews will go back in and complete a permanent repair of this joint during the overnight hours when traffic volumes are much lower. Why don't you just replace these aging expansion joints? We plan to. 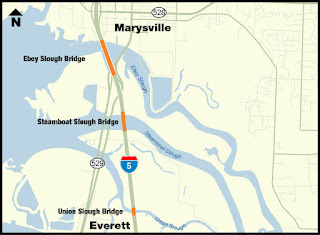 As anyone who's driven through Snohomish County in the past few months knows, we are wrapping up a project there which replaced 41 aging joints over the Union, Steamboat and Ebey Slough bridges between Everett and Marysville. one of the busiest stretches of northbound I-5 in Seattle. 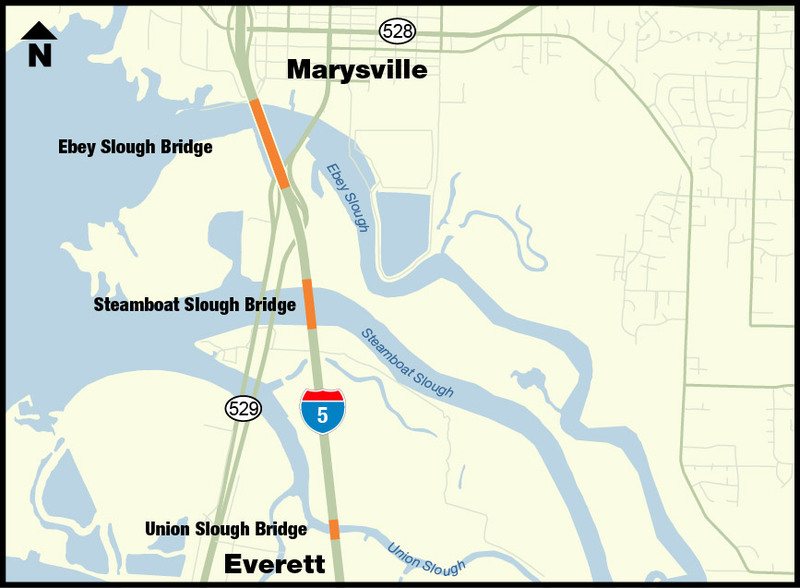 In a month, contractor crews will begin weekend closures to replace aging expansion joints on southbound I-5 between the Duwamish River Bridge and South 320th Street in Federal Way. There will be one weekend closure in August to replace four expansion joints preceded by three others for crack and overlay work. northbound I-5 from Martin Luther King Jr. Way to Ravenna Boulevard. It's a project that will require more than a dozen weekend closures through the heart of one of the biggest cities in the country. Expect construction on this project to start within the next three years. Why so long? Weekend-long lane closures in Seattle are highly disruptive. Before construction can start, we must first carefully coordinate this work with other regional projects and special events. Our bridge teams inspect expansion joints regularly in hopes of avoiding emergency repairs, like the one that happened Friday, but sometimes with the regular wear and tear and pounding of traffic on this busy stretch of aging interstate — the joint decides it has had enough. We appreciate the observant traveler who noticed something out of the ordinary with this joint and took the time to call it in. If you see something on our highways that doesn't look right, please say something to us or call 911. We know that Friday was a pretty awful commute for many people and we appreciate your patience as we worked to safely fix this area as quickly as possible. "Why do you have to close lanes on the weekend? Don't you know there's a game/concert/major event?" Whether it's #SnoCoSqueeze, I-90 or any other major project, it's inevitable that people traveling to events will let us know they are unhappy with our timing. 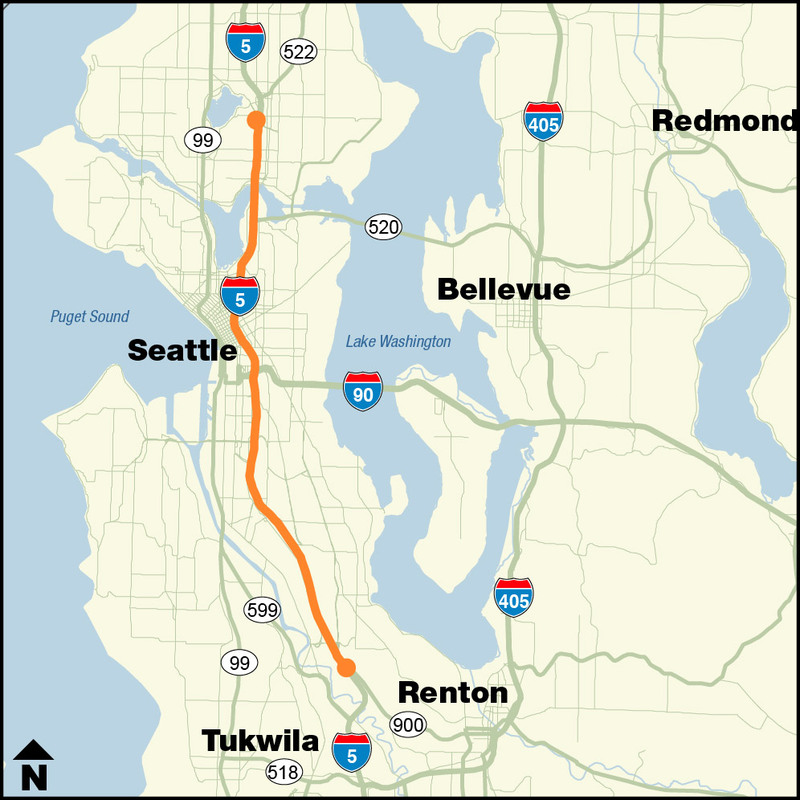 I expect to hear it this summer when we reduce sections of southbound I-5 to two lanes in Tukwila, SeaTac and Des Moines for a major concrete rehabilitation project. 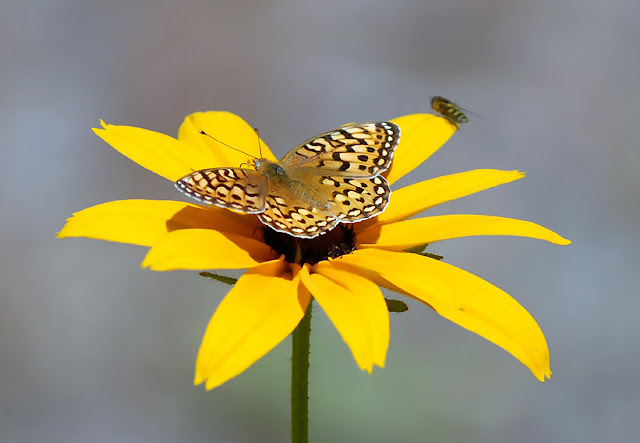 Between July and August we have five weekends of work on this project scheduled – July 8-11, 15-18, 22-25 and Aug. 12-15 and 19-22, weather permitting. Some work can't be done in five- or six-hour overnight lane reductions; we need multiple-lane closures that last a couple of days. 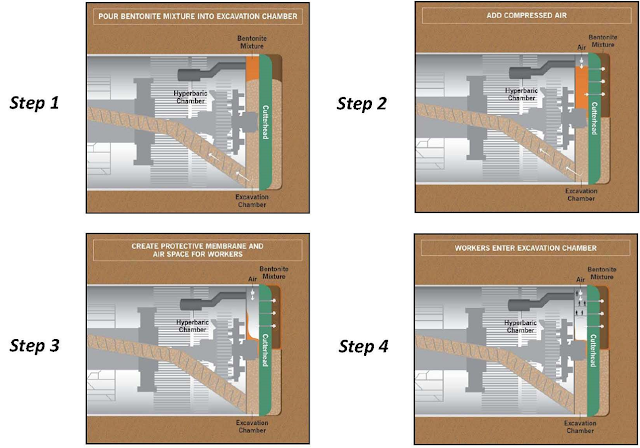 Take expansion joints. We literally have to create a hole in the bridge. Removing the old joint, setting a new one, pouring concrete and letting it cure can't be done in a few hours. Another example is our concrete rehabilitation project on southbound I-5 south of Seattle. I-5 is more than 50 years old. The original designers figured it would last about 25 years. It's time for a major rehab, and we're already doing that in the SeaTac/Des Moines area with nighttime lane closures. For other parts, we need weekends. Expansion joint replacement work like this one on I-5 near Marysville often requires full weekend lane reductions. As we plan a project we determine if weekend lane reductions are necessary, and if so, how many. We start evaluating that one to three years in advance of the actual work. If we allow weekends, it will have restrictions. In this case no work is allowed on Independence Day and on the Seafair Torchlight Parade and Seafair boat race weekends. We also work with the Mariners, Sounders and Seahawks, and we look for major events throughout the region. With so many teams, festivals and concerts, there's usually at least one event every weekend during the summer. This year the one summer weekend with no game, CenturyLink Field is hosting a big concert, so that's a major traffic impact. We ask questions - which direction is the lane reduction? How will it affect traffic getting to an event? What are the alternatives? What can we do to limit the impact on drivers? We also factor in other projects – we don't want two projects near each other both working on the same weekend and making traffic worse. Weather is also a consideration. As we plan the project, we know that we usually need good weather for the weekend work. That means it needs to happen during the summer months when the odds of good weather are in our favor. We put a lot of thought into weekend lane reductions. From a production standpoint, they're great. We can get a lot of work done in a relatively short amount of time. But we limit them because when we weigh the benefit against the impact to the public, often it's not worth the inconvenience for drivers. So when you encounter weekend lane reductions, you can be sure they've been very carefully evaluated, the pros and cons considered and they're important to successfully completing a project. We've all seen it: A box falling out of the back of a truck that causes you to hit the brakes. A mattress tied to the roof of a car so precariously you slow down or switch lanes. Most of the time those are just scares -- but nearly 400 people a year aren't so lucky. That's the number of people injured nationally every year due to debris from unsecured vehicle loads, according to federal estimates. And each of those 400 injuries could be prevented. Renton's Robin Abel knows these stats far too well. She's the force behind "Maria's Law" in Washington state as well as new federal recognition of the dangers unsecured loads pose to anyone on the road. Today, June 6, 2016, Abel is kicking off the first Secure Your Load Day, which she hopes will bring even more attention to the dangers. Abel never intended to become a crusader. But a February phone call in 2004 changed everything. Her daughter, Maria Federici, was blinded by a piece of furniture that fell from a rented moving trailer in front of her and crashed into her windshield on Interstate 405. The impact nearly killed her and made Abel an overnight activist. Maria's Law was signed into law in 2005, and means drivers in Washington face possible jail time if their unsecure loads seriously injure someone. Late last year new federal regulations also highlighted the danger and also made secure load projects eligible for grant funding. Despite increased awareness, though, Abel said she's heard from dozens of families with similar stories and there are still far too many drivers taking risks out on the roads today. Just this past Friday, for example, a 19-year-old Kirkland man was hospitalized with a broken arm when a piece of metal broke free from a truck on State Route 97 near Leavenworth and smashed into his windshield. 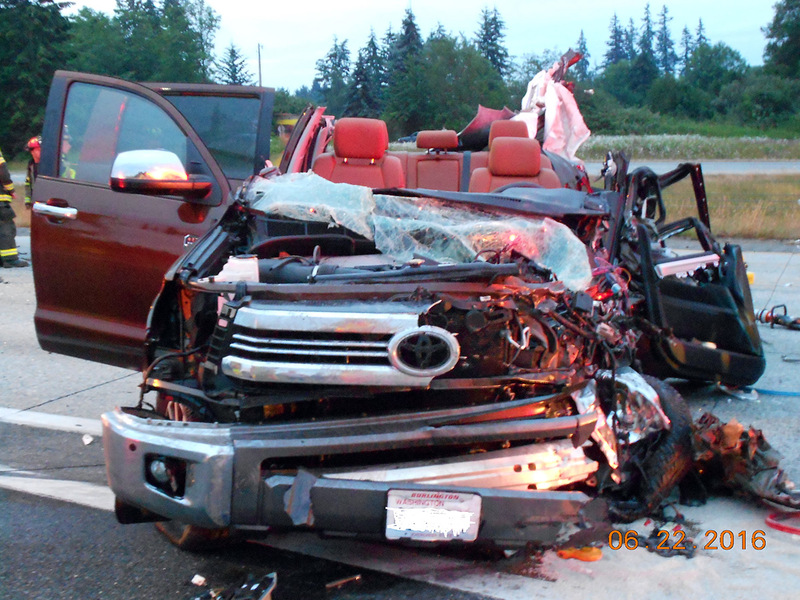 State troopers said he was "extremely fortunate" to be alive. This car was damaged by an unsecured piece of metal, which sent the driver to the hospital with a broken arm on June 3. The State Patrol said the driver of this car was "extremely fortunate" to have survived an unsecured piece of metal through his windshield. "The bottom line is there should be nothing loose in your pickup – nothing," Abel said. "Even a hammer thrown in the back becomes a weapon at 55 mph." Abel isn't done with her work. She wants to reach out to state agencies across the country to raise awareness and beef up penalties. But she said her main goal is just to remind everyone to be careful. "Secure your load as if everyone you loved was in a car behind you," she said. "It can be catastrophic if you don't." Use straps, tarps or strong netting – not twine – to firmly secure loads to your vehicle. The "cram" technique also isn't enough – tightly packed loads can still come loose unless they're tied down. Double check everything is tied down securely before heading out. Speak up. If you see a friend, neighbor or family member with an unsecure load, talk to them about the safety risks. Just in time for summer, we're opening a new stretch of pavement to carpools and transit riders several months early to keep traffic moving in the heavily congested southbound stretch of State Route 167 in Auburn. 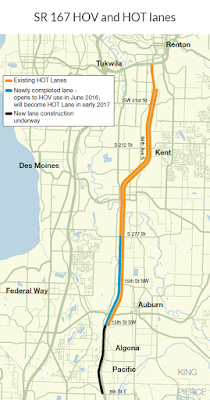 The new lane was originally planned to be opened in early 2017 as an extension of the SR 167 HOT Lanes, but now we're going to open the new 3.5 mile stretch of road to HOV travel early. That's like being able to drive across 50 football fields stretched end-to-end beyond the point where carpools and buses have to exit the HOT Lanes today. Many SR 167 commuters have already noticed the new lanes between 37th Street Southwest and 15th Street Southwest which were built as part of the SR 167 8th to 277th Southbound HOT Lane extension project. We've been listening to questions about why these lanes have been barreled off to traffic and agree that opening these lanes to HOV travel now will give much needed relief to carpoolers and bus riders, while helping to ease some of the congestion in the regular lanes. We want to provide the benefits of the new lane to SR 167 users as soon as possible. The pavement is ready to be driven on now, so we are opening this to carpoolers and bus riders early while we finish roadway widening for the full 8-mile extension and installing new toll equipment. At 5 a.m. Sunday, June 5, we'll open this new lane as a 2+ HOV lane. This will help keep traffic moving through the area where congestion that tends to build at the end of the HOT lane. For now, single occupant vehicles using the southbound HOT lanes will need to exit the HOT lane at 37th Street Northwest and continue their trip in the general-purpose lanes. Carpoolers and transit buses will be able to continue their trip through the newly opened segment. This is similar to the southbound I-405 express toll lanes, which transition to a HOV lane in Bellevue. After the HOT lane opens, solo drivers will also have the option to pay a toll for a faster trip. Before we can open the new 3.5 miles of HOV lane, contractor crews will need a weekend of ramp and lane closures at the SR 167/ State Route 18 interchange. So, if you're planning on using SR 167 and SR 18 through Auburn and Algona the weekend of June 3-5, expect delays—or better yet, use alternate routes. For full closure details, visit the King County Construction page. As construction progresses on the SR 167 HOT Lane extension, additional southbound segments of these lanes will be similarly opened early to carpools and buses. 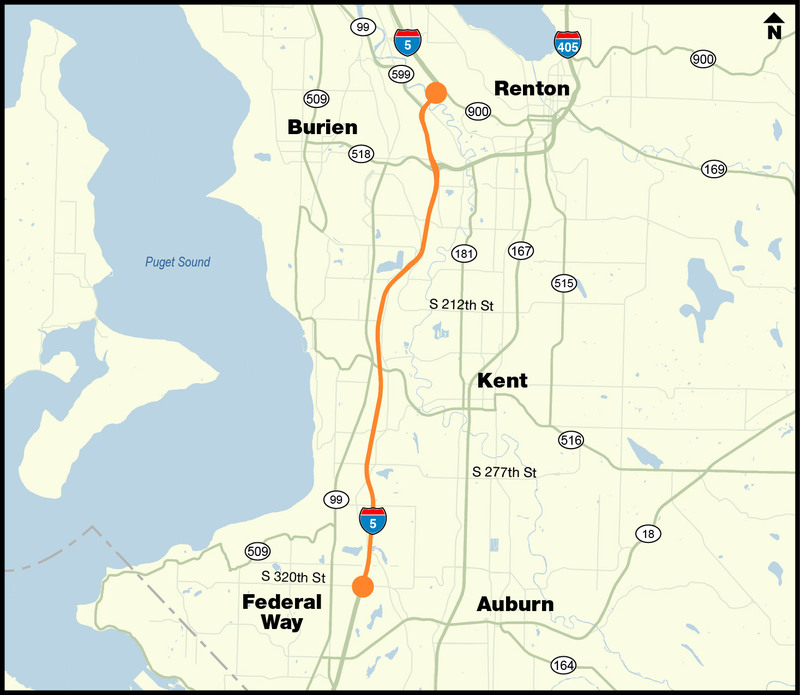 Once tolling equipment has been installed and tested in early 2017, the new lanes will be added to the SR 167 HOT Lane system creating a nearly 14-mile continuous southbound stretch of HOT lanes from Renton to Pacific.